What property is the best investment? Both directors Tony and Peter grew up watching their parent’s struggle financially retiring on a low income. Adamant this would not happen to them. Both with a different story. Tony jumped in early and got sold on hype and sales jargon and bought a poor first investment. Peter continually educated himself and was a seminar junkie, keep looking for the safe, secure and successful formula, and being put off by shiny bum sales guys trying to sell him property with pressure sales, but these years of not acting cost him hundreds of thousands of dollars and precious time. When they started Prosperity in 2007 it was to change the way the industry operates with a focus on getting you the results you need to help you reach your desired outcomes and timeframes. Rather than most companies where it is about sales for them. We want to work with you from here to retirement. Not make a sale and move onto the next person and not caring about your results. Prosperity wantsto change the fact that approx. 90% of Australian’s are set to retire on only $16,000 p/a over their approx.. 23 years in retirement. This is shockingly true fact is from the ABS. Source. We treat you as an individual. As everyone is different with different wants, needs and goals. Different budgets, knowledge base, some need a plan some already have one.When we first have our discovery session with you it is all about how we can help you, it is not about selling you something from a stock list. As it is with most companies.Based on your current circumstance and desired outcomes we provide you with the research on locations that meet your needs and once both parties are 100% sure this is the best location for you. We will have our building partners put holds on some blocks and work with them to design the right property to meet your budget and cash flow, tax benefit and growth needs.Importantly you cannot buy the quality built property for less, and you pick up instant equity to kick start your growth. Building Trade/Development Degrees and Project Management Experience. Both Directors Tony Barber and Peter Ingram come from a building trade background with combine over 50 years. We are not sure if any other company can offer this matched experience. Below market prices on any construction – Bet price negotiations. Complete Project Management from start to finish, ongoing inspections. 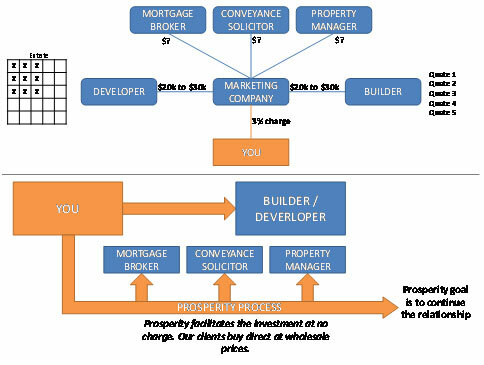 Understanding how to acquire the land at the right price to gain the developers stage increases. Inspection of established houses to help with investment plans through renovations, extensions, knock down re-builds, Granny Flats or development. The most awarded builders and developers in small infill location or award winning master planned communities. We can build whatever is the best property for you anywhere in the country. We all know how important research is, but unfortunately most companies sell from behind a desk with glossy brochures and hypotheticals on growth and R.O.I.Prosperity carries out thorough research identifying the best locations within a location Australia wide. Looking at the micro/macrofind you best property for your needs.To quote the worst house in the best street analogy.We do not recommend any locations unless we have been there ourselves and “kicked the dirt” as we say. To assure all the facts are true, inspecting the location and running our proven investment matrix over the location. We would look at over 300 locations per year only to select approx. 30. The MATRIX was designed by one of our builders at Harvard University and has proven to be correct everytime. We buy where our clients buy. saving you money, time and all the hard work. Based on your needs – Education, Personal Plans, Financial structures, Research due diligence, Quality property options, Complete Project Management, Investment Services surrounding you with experts, to securing tenants, depreciation schedules for your tax and ongoing portfolio management. A common question is how do we make our money, and this sounds too good to be true. We make our money like any builder in the profits from the build. When it comes to building you a new property importantly you cannot buy an apples for apples property for less. We are cutting your costs to the bone so you gain results sooner and you will come back to use our services again for your next property. We want to be with you from here to retirement. We do have a number of consultancy services that are paid upfront services or ongoing pending on the project. For example if you need our building consultancy services, buyers advocate or sellers advocate services. Seven Very Compelling Reasons Why Prosperity Are The Perfect Partner For Your Financial Future. Reason 1. Knowledge. When you choose Prosperity you are placing yourself and your investing future in the safest, most prudent of hands. The depth of knowledge and expertise possessed by our agents and directors, mean you will only ever be guided towards the best properties, those chosen for their potential to yield excellent returns. Reason 2. Experience & Quality Assurance. Our people are property sector veterans with extensive experience, having worked as both tradespeople and investment advisors. They’ve spent years building up strong industry relationships. Through them you’ll be given access to carefully chosen prime real estate and be offered the opportunity to purchase wholesale, directly from the builder. Reason 3. Trust. The property market is a volatile place. The inexperienced can quickly fall prey to the pitfalls of hasty investment, or lack of due diligence. Feel confidence when you take advice and knowledge from the property industry experts at Prosperity, who have worked within the sector for decades, who possess contacts and can discover opportunities simply not available to the average new investor. Leverage on our success and watch your wealth grow. Reason 4. We are your long-term partners. The investment property market can be a tough one. And the property sector certainly has taken its fair share of fluctuations. Why not team up with a company who have ridden out the peaks and troughs of the market and are living proof that quality investments will continue to return value. Our carefully chosen properties are selected for their long term potential. Reason 5. No get-rich-quick schemes. We want to assist you in building your wealth steadily, with a successful property investment portfolio directing you to invest in a property chosen for its quality, offering state of the art house and land packages, duplex’ and apartments, designed to appeal to your ideal tenants, providing you with regular income and tax advantages. Reason 6. A Comprehensive Advisory Service, assisting you from start to finish, with choice of investment, finance, construction supervision, handover and the appointment of a quality property management service. A professional agent guides you through every step and independent legal advice is recommended if you need further reassurance. Reason 7. Personal Prosperity Plan: When you make an appointment with one of our leading consultants, or attend one of our seminars, your eyes will be opened to the vast opportunities the property market offers. And if you decide to proceed, our thorough briefing process enables our consultants to discover all they can about you and your requirements, in order to offer you a bespoke solution designed to suit your needs, budget and investment profile.